Although there’s no doubt it's a visually striking villa, Semarapura’s luxurious functionality seemed to unravel itself slowly so that the more we experienced, the more it drew us in. As we relaxed in one of the sea-view balés, swum in our (huge) private pool, sipped drinks from our own bar (sat on one of the ‘wet seats’ at sunset – wow! ), enjoyed the pampering of the friendly and personable (17-strong) staff team and the comforts of our well-facilitated bedroom, we realised what a great villa it was as it appeared to cater not only excellently for group arrangements but also individuals within a group too; everything has been thought of and there are plenty of private places as well as sociable spots. The pool deck and its adjoining media room was very congenial; you can either watch a movie here ‘en famille’ or select one from the library to watch in your own room ‘à deux’, as every bedroom has a TV. Note that the bedroom TVs can only play DVDs and are not connected to cable channels. It’s no wonder that the villa is a very popular place for weddings and other special events; not only is the location idyllic, but the experience and hotel-like approach of the staff clearly shows through too. The food was good at the villa and the kitchen a delight; if we had mustered up the energy to cook for ourselves, it would have been plain sailing as the kitchen was equipped with everything that we might have needed. As it was, the villa’s suggestion menu listed a range of dishes and we only had to pay for the cost of the ingredients (plus 20% handling fee which is subject to service charge and government tax) so it was much more fun to sit back with a cocktail from the bar until long after sunset whilst someone else rustled up something delicious to eat. The dining room was atmospheric; however it could do with a ceiling fan as well as the air conditioning option so you can comfortably have all the doors open. The villa’s out-of-the-way location could be a good or bad thing depending upon your preference, however we liked the unspoilt coastline and thought that the fact that the villa had its own car (to sweep us into Seminyak for example) really made up for this. For the active, there’s also a shared tennis court and a rowing machine. We had a great stay in Seseh Beach Villa II and found everything to be nigh on perfect with all the modern comforts of home mixed with all the lazy pleasures of a tropical holiday. It was incredibly peaceful and quiet with lots of sunshine and swimming by day, while by night we enjoyed big-screen movie sessions, long leisurely dinners and the sounds of the waves lulling us to sleep in our super-soft beds. After spending much of the day beside the pool, sunset proved to be the best time to head down to the beach for a wander along the sands and a paddle in the surf. There are no lifeguards here and the water can be a bit rough, so swimming is not recommended. In the evenings, it was fun to gather around our own private bar for a pre-dinner drink. The chef here is a very talented man, and the Balinese and Indonesian specialties that came out of his kitchen were superb. Getting out of our incredibly comfortable bed in the morning was made easy in the knowledge that a hearty breakfast would soon be on the table. Surya Damai was built primarily for the owner’s use and it is clear that they appreciate quality and simple sophistication. There is nothing pretentious, flashy or overdone here. 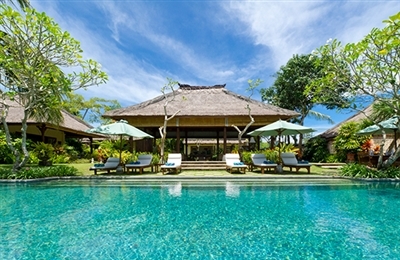 By contrast the villa exudes calm confidence throughout, casually elegant, everything from the colours, furniture, artwork and gardens all fit together effortlessly and draw you deeper into its welcome embrace the longer you stay. If you want to get away from it all, relax and unwind in the blissful knowledge that nothing is too much to ask of the well-trained staff, then this is you. 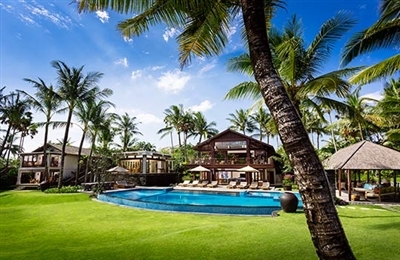 Meals, massages, knowledge of tracks through rice fields to the beach, shopping or making restaurant reservations for dinner are all taken in smiling stride, and if you must connect with the outside world wireless internet and satellite television are available. There is plenty of space for all, relax on a lounger or read a book on a comfortable day bed while children splash in the pool, play on the lawn or wear themselves out on the tennis court. A flick through the guest book confirmed our feeling that the experience regularly surpassed expectations and the hardest part for many guests is saying good bye and returning to the real world. Seriously spacious, perfectly configured and delightfully uncluttered, Umah Daun was an absolute pleasure to stay in. The gentle curves of the building mimic the contours of the rice terraces, and the ponds that wrap around the ground floor, coupled with the glass doors that fold right back, made us feel like we were part of the scene rather than just looking at it. Villas of this size can be a little austere and overwhelming, but there is enough colour in the décor and verdant landscape at Umah Daun to make it feel warm and intimate. Our favourite design feature was the beautifully carved antique door shutters coloured in shades of teal and turquoise, which make stunning features on the white walls, as well as lovely bed heads in the childrens’ rooms. Bedrooms are large and very comfortable and there are plenty of daybeds and sofas piled high with plump cushions that provide comfortable vantage points for soaking up the views and the peaceful ambiance. 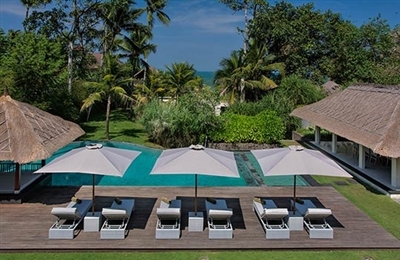 It is such a lovely space, and the staff took such good care of us, that we didn’t really feel the need to go anywhere, but it was good to know that both the beach and Seminyak were easy to reach should we fancy a sunset walk or a meal out. Villa Bougainvillea truly is an escape from the world at large. From the discreet driveway to the lush river banks surrounding the villa, we had a sense of being hidden away in a very private home, and this feeling continued once we were settled in, with each bedroom being screened from the rest of the villa by the tropical gardens. Whilst we appreciated this sense of escape we also quickly realised that the villa’s spacious living pavilion overlooking the pool was a great social hub and enjoyed lazing on the daybeds or sitting for leisurely meals at the solid wood dining table, being looked after by the friendly villa staff. The pool was definitely the focal point of our stay: its setting, between the steep stairs to the living pavilion and the river below the pool’s own infinity edge, under a canopy of colourful local trees, gave a wonderful sense of drama. It was easy to spend hours literally soaking in the calm tranquillity of Bougainvillea. 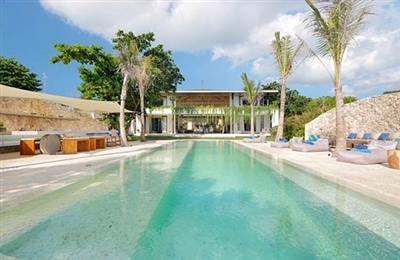 Any feeling of isolation is, however, only a clever illusion as the villa is a mere two to three kilometres from the increasingly popular beaches of Berawa and Pererenan where there is also a growing number of restaurants. 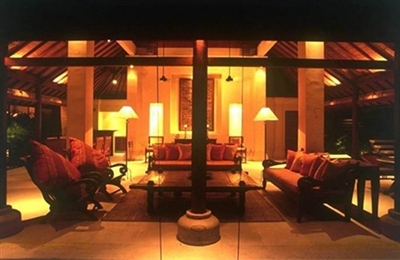 Bougainvillea is also one of eight private villas which make up the Pangi River Village complex so multi-villa rentals would make this an ideal location for larger groups (see location section for links to the other villas). The Staff were very efficient and helpful and happy to arrange anything from shopping for groceries to massages or tours. If you require a car and driver, however, this is charged extra and you need to plan ahead. While the architectural design is attractive, it’s the décor and furnishings that really set Villa Paloma apart. The owners spend a lot of time here (when not rented) and it shows; not only does Paloma look fabulous, it is also a highly liveable and very comfortable space. The wonderful collection of antiques has been hand picked by the owners and reflects both a passion for the culture and artwork of Indonesia, and impeccable personal taste. Villa Paloma manages to be sumptuous without being over the top and feels more like a real home (albeit a supremely luxurious one) than a rental villa. The true beauty is in the details, the intricate floral designs carved into the antique daybeds and cabinets, the framed tribal neck pieces, the decorative platters on the coffee tables, the frangipani scattered around the boulders by the pool. Thoughtful modern trimmings include crimson batik-edging on the pool towels, and thick soft bath towels stacked in attractive layers of red and white. Separate guest quarters make this villa good value, and ideal for groups or families who want a little privacy. The poolside lounge and casual all-weather dining setting framed by the picturesque garden and a big blue sky is perfect for alfresco meals.